Marketers everywhere are emphasizing the importance of video marketing, claiming that online video is the future of content marketing. People are spending more time watching digital videos than ever before, with average watch times jumping from 21 minutes per day in 2011 to one hour and 16 minutes per day in 2015. Moreover, researchers predict that by 2019, 80 percent of all internet traffic will be video. But video has had it's limitations on sharing...until now that is. The new breakthrough Video-In-Email feature from TailoredMail is changing the face of video marketing. At SXSW 2016, I learned about a company that is allowing small business owners to use video in an innovative way. 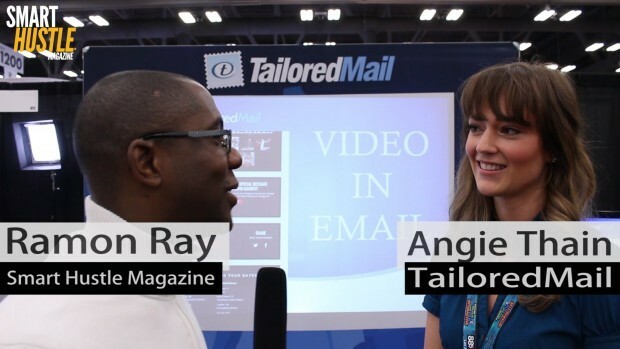 TailoredMail is an email service provider that has a Video-in-Email feature that allows you to embed a video right in your email. I caught up with Angie Thain, the VP of Client Operations, who told me more about the service. TailoredMail uses HTML 5 to embed video that can stream from right inside the email, using the natural video player in your email. That means no attachments, no worries about file sizes, no downloads, and no links sending people away from the email to watch the video on YouTube. TailoredMail is popular in the entertainment industry, where artists and musicians can send video songs then encourage people to download the album, or send promos of an upcoming tour and encourage people to buy tickets. The same concept can be used by business owners. In the interview, I asked Angie how a small business owner – say a cupcake shop – may use TailoredMail. Her marketing idea was brilliant: create a video of your brand new cupcake. Show it off, talk a little about it, perhaps the ingredients or how it is made, then encourage people to come down and try it. The possibilities are especially exciting if you run an online business. The reason is that you can pair the rest of the email content with the video. For example, people can watch the video about the product and then the text can include a link for people to buy, sign up, etc. In this way, your video emails can be used to boost your leads and your sales.
.@TailoredMail has changed email forever. Check out how they have made #videomarketing easier. You could use email to send people to your YouTube or Vimeo videos, but it wouldn’t work as well because people wouldn’t stay in the email and therefore wouldn’t get the full impact of your call to action. We all know that it is easy to go to YouTube and get lost watching video after video. By presenting the video right inside the email, people can watch and get the full impact of your call to action, which means more leads and sales. Consumers have a lot of choices regarding who they can do business with, and personal connections are often the deciding factor. Using video, your customers or leads can see you and interact with you much better than with text-based marketing, allowing them to form personal connections and brand loyalty.